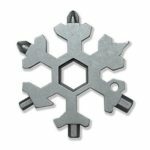 This upgraded 19 in 1 snowflake multi-tool features Flathead screwdriver, #3 and #2 Phillips screwdriver, 4/5/6mm Allen wrench, box cutter, 1/4 inch end wrench, 5/6/7/8/10/12/13/14mm end wrench, hole for keyring, bottle opener. 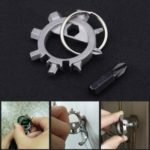 You can use it to open the beer bottle, turn the screw, fix bicycle and all the appliance when you need, open carton box and so on. It small and lightweight that is so easy to be taken along with and can be as a gift or hanging drop. 19 tools including Phillips/flathead screwdriver, Allen key, box cutter, bottle opener etc. 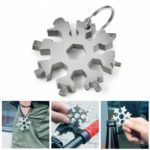 Made of stainless steel, corrosion-resistant, not easy to rust, polished surface, durable. 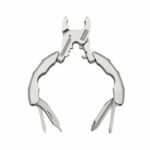 The tool is only 6cm in diameter and is easy to carry. It can be hung on a key or a backpack. 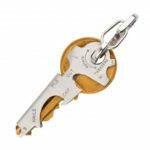 Can be used to open the beer bottle, turn the screw, fix snowboarding , bicycle, toys, and more. It can be used for outdoor sports, camping, boarding, adventure, rescue, and everything that might be used.